Should you spend all day on a job search when you're out of work? How about when you're employed and juggling a job and a search for a new position? Career counselors are often asked how much time a job seeker should spend on finding a job. The formula will vary based on your life and work circumstances and goals, but here's a framework to use to decide how much time you can allocate to your job search. There’s a fine line between not spending enough time and spending too much time and getting stressed. If you don't spend enough time, your job search won't get off the ground. If you spend too much time, you're likely to burn yourself out. 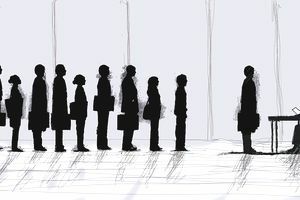 It would be easy to say that finding employment should be the person's full-time job, but, realistically speaking, 40 hours per week of job search activity would be more than most individuals could handle. A more reasonable target for would be 25 hours per week for those who are not working in an interim job or an internship. For those who are working, 15 hours per week would be a more suitable allotment of time. 5 hours per week should be devoted to composing and refining job search communications including resumes, cover letters, and follow-up letters or emails. 3 hours per week searching for and applying to posted jobs through online sources including job sites and employer websites. 3 hours per week identifying organizations in industries and locations of interest to target as prospects for inquiries regarding employment prospects. This time would include completing online profiles and inputting resumes into employer databases. 3 hours per week traveling to and participating in interviews. Attendance at job fairs would be included in this allotment. This time would vary greatly from week to week depending on the number of interviews secured. 11 hours per week should be devoted to various networking activities. Informational Interviews - Ask your college's career and/or alumni office for a list of alumni working for companies, industries or in career fields or locations of interest. Reach out to as many alumni as possible and try to schedule informational interviews to learn more about their field and get advice about conducting your job search. Job Shadowing - If you hit it off nicely with any alumni, ask if you could shadow them throughout a day or two on the job to gain a concrete understanding of their role. Networking Events - Inquire with your career and alumni office about any social or networking events in your region or locations of interest as a way to interface with additional alumni. Use LinkedIn - Create or enhance a LinkedIn profile and join groups for your college and career fields of interest. Contact fellow group members to get advice and generate additional informational consultations. Use Your Personal Network - Enlist the support of your family and friends to network. Create a flyer with a current picture of yourself and detail some recent fun and interesting developments in your life. Include a request for them to share any contacts working in fields, locations or for companies of interest as well as any advice for your search. Mention that you will reach out to their contacts for informational interviews. Email or send your flyer to everyone on the list, since you never know who they might know. Ask Your Friends - Review your list of Facebook friends and reach out to anyone working for an interesting firm or industry. Ask if you could visit them at work for an informational interview, and they may introduce you to colleagues who can influence hiring. Earn Some Extra Money While You Make New Connections - If you need to work to generate some cash flow while you search for a career job, consider positions which will give you a chance to interact with the public like a server, a front desk worker at a hotel or a bartender. As you provide excellent service and develop a rapport with clients, let them know more about your ultimate interests in a casual way. You may be surprised how many business cards and referrals you can obtain. Even with this long list of potential job search activities you will still have plenty of time for fun and socializing. After all, 25 hours, is only 22 percent of your waking hours. A balanced life will help you to keep up the energy necessary for a viable job search campaign.